If dozens of exercises are intimidating to you then total body workouts are ideal for you. You can target almost all major muscle groups at once, save time and boost your metabolism maximally. Athletes should use them regularly to build explosiveness, bodybuilders can do them for strength and low-weights, high-repetition training with these full body exercises will make cardio obsolete for fat burning. In this article you will find: Free Total Body Workouts and Routines for quick, complete & Full body training. These Exercise Routines take less time and provide total body stimulation. Choose from 2 and 3 day workouts to build muscle and lose weight faster. And If you are a Beginner Weight Trainer or just plain short on time then Total Body Exercises are better option than Isolated ones. There are 2 simple ways to perform a full body workout in one session. One way is to add a total body exercise to your existing workouts. The second is to do whole body training 2-3 time a week called Circuit Training instead of Split Training. I will cover both these options in detail below. Total Body Exercises trains your major muscle groups in full and are best in terms of returns. These Exercises train both the upper and lower body together. 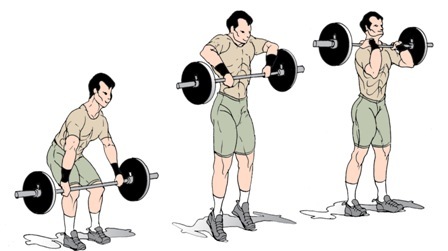 First Two: Two best exercises are the Barbell High Pulls and Thrusters. Next Two: Also Clean N Press and Push Presses. Last Two: Although deadlifts and Squats do not entirely qualify as whole body, you will do great with them too. Make sure you do these exercises every week at least once. If you are new to training then wait for 2 weeks before you add these two exercises as they require greater co-ordination and strength. You can do Stretching and Cardio for these two weeks and train with empty bars. Remember correct execution technique is the key. With better form and quality reps will come better results. I don't want you to fail so I have written a lot of beginner articles in the Weight Training Basics section on correct exercise technique, exercise selection, proper grips and warm up & cool down exercises. Please use them. You will be light years ahead of your partners. If you are into sports, then the barbell and dumbbell high pull done explosively is a great exercise to target your fast twitch muscle fibres. 1. Load a barbell with about 30% of your deadlift weight and let it slide close to your shins. 2. Grab the barbell with an overhand grip hands placed about 1.5 times the shoulder width. 4. Now pull the bar explosively, as fast as you can but under controlled motion pulling the barbell with the arms and bringing them to shoulder level. This is the normal high pull, but I suggest you add a clean or press or both to this to make it a bigger move. 5. From the pull position you can reverse the movement and finish the high pull move before repeating it. 6. You can clean the bar on to the shoulders by twisting your wrists at the top of the pull movement and let the bar rest on your shoulders as in a front squat position, only with hands placed further apart. 7. You can press the bar overhead as in Clean and Press exercise. 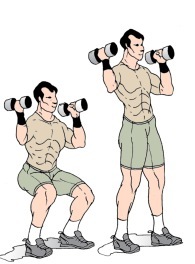 Variation - Use dumbbell instead. 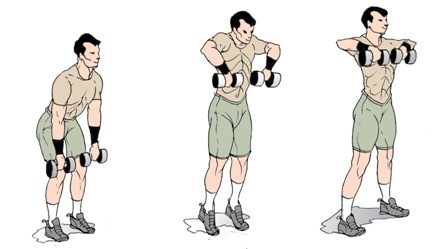 Done with dumbbells, thrusters is a combination of squats and overhead press. Remember this calls for greater hip flexibility. So stretch your hips before you try them. Grab a pair of dumbbells and raise them to shoulder level. The grip is neutral. 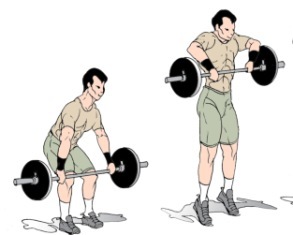 With a wider than shoulder width stance, squat down until your thighs are parallel to the floor. Squat up using your hips and knees simultaneously and while doing so press the dumbbells overhead to do a shoulder press move. Initially this exercise can be tough in terms of balance and flexibility. Try with low weights or an empty bar. In this move, perform deadlifts and barbell rows in an alternating fashion. One deadlift repetition is followed by a barbell row repetition and the set continues until you can do either of the two moves in proper form. I have explained the kettlebell version. 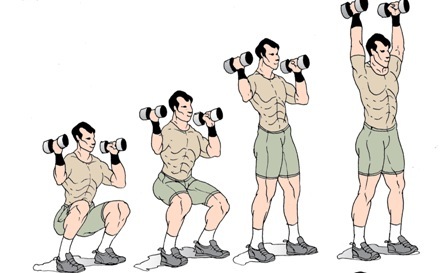 It can be very well executed with dumbbells too. Try the farmers walk exercise and tell me what part of your body is not exercised? I rest my case. Here you will be training your whole body in one workout, take a 2-3 days break and repeat the workout. You can change a few exercises each workout. This routine is excellent for beginners or busy people as it provides excellent benefits for very minimal investment of time. I started with this routine and then went on to do split training as I became Advanced Trainer, thanks to my busy college days. How Often to do Full Body Workouts? can you do full body workout 3 times a week? Find out Full Body Workouts Frequency here. Also please read the article on Split Training to see if its for you. Frequency - Twice weekly is the best. Sets - One set each. You need to perform one exercise, rest 30s and then immediately move on to next. In this way you complete one circuit. If at the end of first circuit you feel enough energy then you can perform another circuit. The Exercise descriptions are available in the Exercise Database Section. If you have dumbbells you can add dumbbell shoulder press, dumbbell chest press, biceps curls and triceps extensions also. 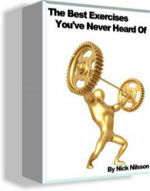 I have covered Circuit Training Workout and more information on Circuit Training methods here. P.S. - Another very useful way to train full body is via Cross Training. Since no single exercise can train for strength, cardio and flexibility at once, Cross Training is an excellent option for total fitness. Cross Training helps muscle and body balance, avoids workout boredom and provides consistent results. Simply stated Cross Training means combining exercises to train for total fitness. Learn more about Cross Training in this article. Just click here to find out 65+ new innovative exercises to eliminate boredom, plateaus from your workouts and take your workouts to next level.